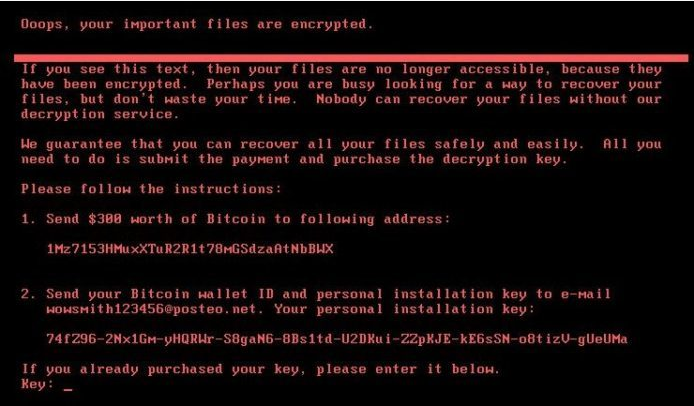 Do you know, Recently Petya/GoldenEye Ransomware is attacking on many computer and system of us, ua, asia pacific india regional countries . But many people don't know how to prevent from ransomware Petya/GoldenEye attack. Lets know and do this and be secure your pc. This is as like as WannaCry, Petya uses the Eternal Blue exploit to infect Windows devices, especially older Windows systems. Not like WannaCry which encrypts the files one by one, Petya is much more dangerous that can damage the whole hard drive, even stop you entering your system. How to Prevent Petya/GoldenEye Attacks? Ransomware attack can be a real disaster as it threatens your important files and money. So you need to keep alert to any suspicious action on your computer. Once you get this popup below, you should shut down your PC immediately in case of infecting Petya. System vulnerability is always the target of ransomware. It’s crucial to keep your system up-to-date. Or you can go to Microsoft Official Site to download the latest patches for your older version Windows. WMI runs automatically at system startup under the LocalSystem account. The service can be used by Petya to spread the ransomware. Note: If WMI service is not running, you cannot manage, monitor, or retrieve information about the resources on the computer, especially remotely. Besides, you probably can't use Action Center on Windows 10 and Windows 8 without WMI service. A strong password can help you improve the security of your system by preventing malicious programs from accessing your system easily. For example, you can mix the password with capitalized letters, symbols and numbers. SMBv1 is a very old deprecated network protocol and might be attacked by Petya ransomware. You can probably disable it to prevent the attack. But there's a potential impact that file and print sharing won't work anymore on a local area network. The most effortless but effective way to block ransomware is making good use of a system security tool which offers anti-ransomware engine and real-time protection. 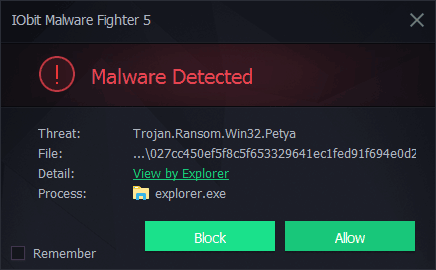 IObit Malware Fighter 5 is one good choice for you to detect ransomware threats in real-time and protect the computer against Petya attack. Hard Disk MBR can be easily tampered and encrypted by ransomware like Petya/GoldenEye. Most of Windows devices infected Petya/GoldenEye because of its vulnerability. IObit MBR Guard is a simple filler for disk, it can protect MBR from malicious tampering and encrypting. To avoid losing your important files, especially encrypted by Ransomware, it’s better for you to develop the good habit to make a back-up regularly and properly.